Amidst a setting in which the earth and its inhabitants are becoming increasingly agitated, Pliny and his mother act with a strange calmness, simply moving to an open space (area) where the roof is less likely to fall in on them. This space is narrow (modico spatio) and separates the built (tectis) and marine (mare) environments; its straitness is re-emphasized below in section 6 (‘angusto‘). 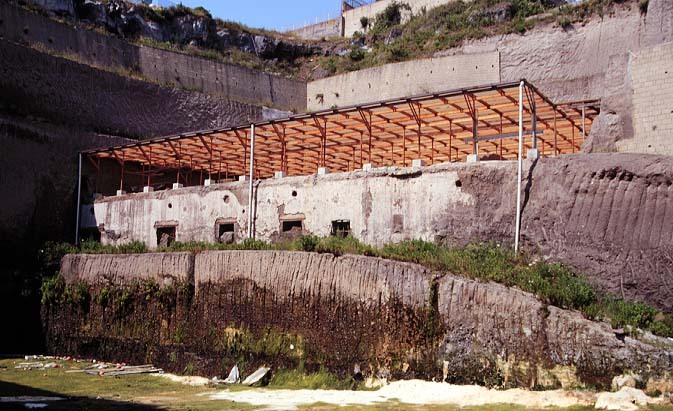 We ought to understand a kind of seaside terrace, of the sort known from the villas at Stabiae and recently revealed at the Villa dei Papiri in Herculaneum. Again this parallels letter 6.16, as sections 6.16.15-16 compare the dangers of staying inside vs. outside. The Elder Pliny behaves serenely in the face of catastrophe, as do his sister and nephew; they are ‘of a mind’ that does not panic. Younger Pliny admits that this may have been foolish (imprudentia, section 5 below), but it is part of his youthful character role — someone expected to follow the instructions of older, wiser men (his mother plays an analogously deferential role). What emerges in this letter is a suddenly awkward rite of passage in which the Younger Pliny must grow up and take on the eldest-male-in-the-household role, in strange synchronicity with his uncle suffocating across the Bay of Naples. Pliny expresses uncertainty in explaining why they sat along the sea while the house shook around them. He will fall back on a strongly inculcated habit: when in doubt, study. Angelica Kauffmann, Pliny the Younger and his Mother at Misenum, 79 A.D. (1785) Princeton University Art Museum. For a detailed study of this painting, see: V.C. 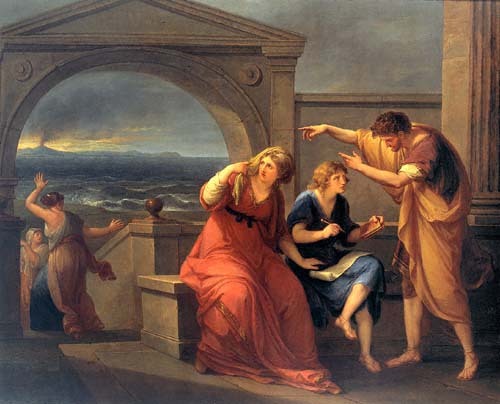 Gardner Coates, “Making History: Pliny’s Letters to Tacitus and Angelica Kauffmann’s Pliny the Younger and his Mother at Misenum,” in S. Hales and J. Paul, Pompeii in the Public Imagination from its Rediscovery to Today (Oxford 2011) 48-61. 5 Dubito, constantiam vocare an imprudentiam debeam (agebam enim duodevicensimum annum): posco librum Titi Livi, et quasi per otium lego atque etiam ut coeperam excerpo. Ecce amicus avunculi qui nuper ad eum ex Hispania venerat, ut me et matrem sedentes, me vero etiam legentem videt, illius patientiam securitatem meam corripit. Nihilo segnius ego intentus in librum. 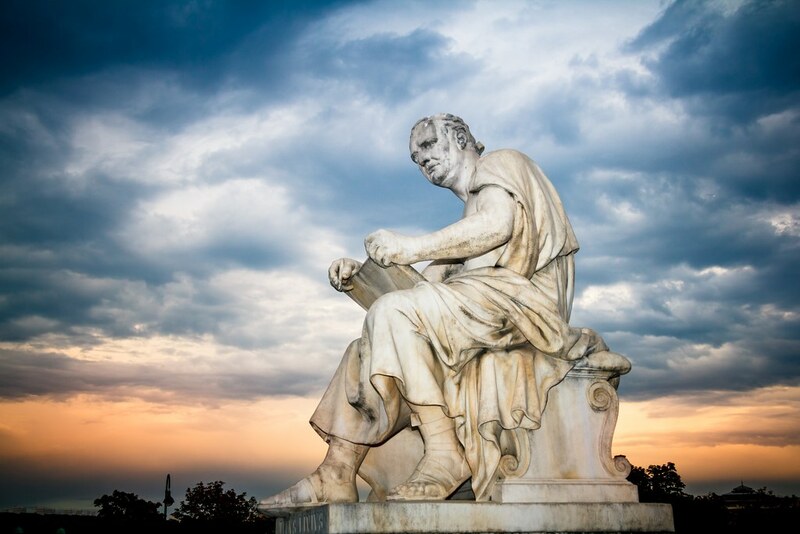 5 I am not sure whether I should call it intrepidity or ignorance (for I was seventeen years old): I ask for a book of Titus Livius, and I read and take notes as I had begun to, just as if I were at ease. And suddenly a friend of my uncle — who had recently come from Spain — when he sees me and mother sitting down, and indeed me even reading, he admonishes her forbearance and my unconcern. No less actively, I remain focused on my book. Dubito might make one expect a doubting clause with quin, but such clauses appear with a negated verb of doubt or denial. Here Pliny uses a deliberative subjunctive, with the ‘either…or’ separated by ‘an‘ plus the infinitive vocare, as the hinge between the two reasons for his hesitation, his mind now wavering like the columns and beams of his house. Observe the qualities Pliny ascribes to himself: constantia, imprudentia, securitas — all contextualized by the revelation of his age at the time. Constantia refers to steadiness, and evokes the Elder Pliny’s lack of anxiety in 6.16. Absence of worry in the face of actual danger is a kind of foolishness; this is why his uncle’s Spanish friend is about to chastise him. Imprudentia refers not to idiocy, but simply a lack of knowledge and experience, which Pliny reflectively (and perhaps stereotypically) ascribes to his youth: “agebam enim duodevicensimum annum” (for I was seventeen years old). The Romans counted inclusively, which is why duodevicensimum translates to the ordinal number ‘eighteenth’. Statue of Livy in front of the late 19th-c. Austrian Parliament Building in Vienna (Tacitus and other historians are also represented there). In conditions of hazard and uncertainty, Pliny finds his comfort zone in studying. Here we learn what specific assignment his uncle had set him yesterday, prior to leaving to investigate the eruption (in 6.16.7 — the phrase etiam ut coeperam tells us this). Titus Livius is Livy, the Roman historian, who lived ca. 59 BC – AD 17 (the dates are not secure). Livy’s monumental (and partially surviving) work was Ab Urbe Condita Libri, a history that proposed to chronicle Rome from its founding in 753 BC to the middle of Augustus’s reign in 9 BC. Livy was — and is — considered the historian of the Roman Republic. Pliny’s correspondent Tacitus has by his time already published works about the Germans and his father-in-law Agricola, but is clearly hoping to become the historian of the Roman Empire with his forthcoming Histories. Pliny is writing these letters to Tacitus to help his friend in that cause. Pliny may also himself be dabbling in writing history; though he repeatedly denies it (6.16.21-22; 6.20.20), he seems to protest the point too much. When Pliny describes his studying (quasi per otium), there’s an echo of his uncle’s pretense of cheerfulness (similis hilari) during dinner at the Stabian villa of Pomponianus (6.16.12). The use of the term otium also invokes the adult value of ‘studied leisure’ — what a Roman aristocrat could afford to do (and preferred to do) if politics and business (literally the opposite, neg-otium, the root of our word ‘negotiate’) did not get in the way. As Pliny remembers back to this moment, is he nostalgic for a more innocent stage of his life (before the tyranny he suffered under Domitian and the praise he felt he had to give Trajan)? Does he recall a younger self wanting to be more grown up than he actually was, but soon compelled by this natural disaster to take actual responsibility in a suddenly dangerous real world? What Pliny has to do is to read and take notes (lego atque…excerpo) on Livy. The painstaking process of outlined annotation (fare degli appunti; la schema) makes up a substantial part of homework for secondary education in Italy still today (Students and teachers do not all agree that this is a good thing.) The American educational system tends not to demand such assiduous practice of reading-to-write, so it is often introduced at the college level, often too late to become a useful habit. The pretended ease of Pliny and his mother are interrupted (Ecce) by a friend of the Elder Pliny recently arrived from Spain, as the relative clause (qui…venerat) describes. And ut + the indicative verbs videt and corripit must be understood temporally, as ‘when,’ ‘after,’ or here, with its sense of urgency, ‘as soon as’. The objects of those verbs are modified by present-active participles sedentes (Pliny and his mother) and legentem (just Pliny, emphasized with ‘vero etiam‘, as if the Younger Pliny thinks back incredulously upon the much-Younger Pliny’s stubbornness). This elegant parallel construction is repeated with slight variation when the visitor lambasts illius patientiam securitatem meam. The lack of a conjunction, such as ‘et,‘ is asyndeton, which adds a sense of franticness to the atmosphere. The Spanish visitor (who reappears in 6.20.10) must have used strong language (corripit suggests impolite words that Pliny chooses not to remember or quote directly, or perhaps it nods to Tacitus’ usage as a term for political and legal accusation). Nevertheless, Pliny stays put, obstinately and contrarily holding onto his lifejacket of a book. His literary studies are still a safe place, even if the world no longer is. Nihilo segnius translates to none the slower (segnis); that is, zealously. Pliny has repeatedly taken pains to impress his uncle, his friend Tacitus, his uncle’s friend, and the reader with his focus on study. And while Pliny himself is not sluggish, the sense of this adjective will be transferred in the next sentence to a day that refuses to resolve into its customary clarity. 6 Iam hora diei prima, et adhuc dubius et quasi languidus dies. Iam quassatis circumiacentibus tectis, quamquam in aperto loco, angusto tamen, magnus et certus ruinae metus. 6. Now it was the first hour of the day and so far the daylight was overcast and almost feeble. At this point, because the surrounding rooms were shaking violently, although [we were] in an open space, it was nevertheless narrow, and fear of collapse was considerable and inevitable. This first sentence wavers in and out of focus, framed by a specific and immediate temporal marker ‘iam.‘ Right now, it is sunrise (‘hora diei prima‘), but the next four major words emphasize vagueness and uncertainty: adhuc: ‘up to this point’ (not a specific time); dubius (from duo+habeo, ‘holding two different things at once’, and so ambiguous); quasi (‘like’ or ‘as if’ but not anything true to itself); and languid (‘weak,’ ‘dull,’ ‘faint’). The word dies is also used twice, and it does mean ‘day’, but not just in the sense of a new day, but in the appearance of the sun that reveals the world once more. Because of the eruption, the expected dawn is blurry — not truly bright enough to even be called ‘daylight.’ Time itself is muddled. The dissolution of the boundary between night and day is echoed in the instability of the earth. Quassatis is onomatopoetic word, providing a sound effect for the narration. Like a contemporary example, the Batman screen capture (‘BAM!’), quassatis is a violent word; it shakes off the torpor of the previous sentence. Furthermore, ‘quassatis circumiacentibus tectis” is an ablative absolute, a circumstantial participial clause — the shaking is now happening constantly around them (‘circum-‘). 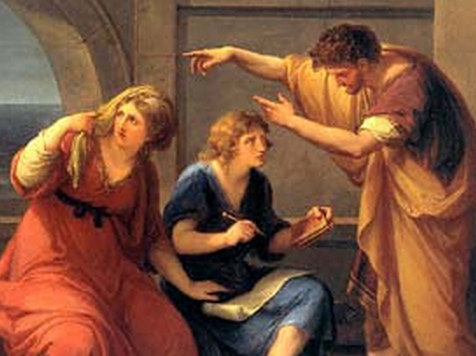 Younger Pliny describes a scene in direct contrast to the experience of the Elder Pliny. Instead of huddling under the roof trying to escape the falling rocks, they are taking refuge in the open area where they can’t be hurt by the roof itself, but even that protection is narrow “angusto tamen”. As stated in 6.16.15-16, the danger of an indoor collapse was real. A 2003 study done by G. Luongo et al. 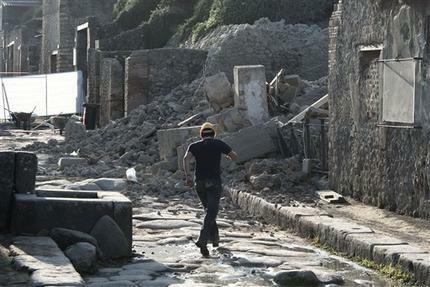 discovered that 38% of human casualties at Pompeii were from falling debris, and 90% of that number was from indoor collapse. Sadly, the walls of that ancient site are increasingly prone to falling down today, after centuries of exposure, erosion, neglect, and tourist wear-and-tear. Everything is so unsettled and uncertain that now only one thing is sure (certus): fear. Yet Younger Pliny and his mother still do not move. The lad is still trying to stay calm and imitate his uncle. The repetition of iam recalls its triple repetition in letter 6.16.11. Pliny does this to build a similar sense of play-by-play, but because the word iam only appears twice instead of three times, it hints that his dangers are tamer than those faced by the Elder Pliny. This reinforces a recurring message about the Younger Pliny’s adventure (see 6.16.21-22; 6.20.1): his experience of the Vesuvius eruption could not have been as significant as that of his uncle. The sentence also describes a shift in Younger Pliny’s own demeanor. Insouciance is turning to fear. In the next section, fear will motivate movement, and Pliny will describe the extraordinary sights that warrant trepidation. Fascinating translations and interpretations. Am reading this whilst on holiday near Pompei and jab been fascinated. Keep up the good work!